SYSTEM OF SPELLING HERE ADOPTED. g always hard, as in go. k as ch in loch. s always light, as in sit. w and y are used only as consonants. lth represents a sound made by expelling the breath while the tip of the tongue touches the palate. Hyphens are occasionally introduced to aid the reader in dividing the syllables. Thanks are due to Richard Mammana, who provided and transcribed the text. This book, in PDF graphics, is also available from the Internet Archive. Haida is an endangered North American indigenous language spoken today by just over 300 people mostly on the Queen Charlotte Islands (or Haida Gwai'i) off the coast of British Coliumbia. (A small group of Haida speakers also live in southern Alaska.) Haida is considered by many to be unrelated to any other language. The Haida in pre-contact days numbered about 10000, and were known for their warlike ways and as one of the originators of totem poles. They were decimated by European diseases until there were only 700 or so by 1900, but have since recovered substantially. The Haida language today appears to be increasing with innovative revival projects. Anglican missionary presence on Haida islands began in 1876 with the arrival of William Henry Collison (1847-1922). For an account of contemporary Anglican missionary life in the Queen Charlotte Islands region by Collinson himself, see In the Wake of the War Canoe (1915). 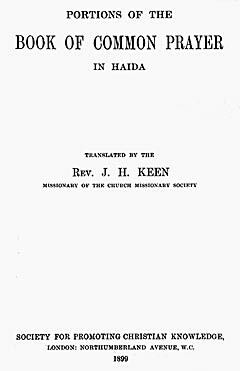 This translation of parts of the 1662 Book of Common Prayer, believed to be the only Anglican liturgical translation into Haida, was prepared by John Henry Keen (1852-1950). After training at the Church Missionary Society College in Islington, Keen was ordained for service at Moose Fort, Ontario, in the Diocese of Moosonee. He served here for seven years, returning to London for two curacies between 1882 and 1890. Keen returned to North America in 1890, when he took over the CMS missionary station at Masset, Graham Island, British Columbia. It was here that he began his Haida language study, remaining for eight years until a furlough in England "as [he and his wife] had experienced the isolation of island life very intensely". On returning to Canada, the Keens began a ministry at Metlakatla, British Columbia, where they remained from 1899 to 1913. An accomplished entomologist, ornithologist and linguist, Keen published a Grammar of the Haida Language and translations of portions of the Bible into Haida. Today there a number of ways to write Haida, all of which are considerably different than that used here.